Some product attributes are optional, but we strongly encourage to map these to Nosto if they exist in your e-commerce solution as they make recommendations stronger, enable advanced merchandising options to you, and allow more informative recommendation design, for example when customer reviews and ratings are present also in recommendations and not only on product pages. If attributes are not available, simply leave them empty. Should you see a prompt as below in your admin panel when configuring recommendation filters it indicates these values are not mapped to Nosto, meaning you can’t use these filter types. As mapping attributes differ slightly between different platforms, in this chapter we cover how these are successfully mapped to Nosto. In Magento, navigate under System > Configuration > Services > Nosto > Ratings & Reviews. Choose the review and rating service you use from the dropdown. Support for ratings in Magento is from Nosto Magento extension version 2.10 or above. On Shopify, if you use Yotpo and rich snippets are enabled, reviews and ratings are automatically mapped to Nosto. If you use another system or service for reviews and ratings, contact Nosto’s support and ask if your service can be supported and please send details of the Shopify property where you store ratings. Ratings are not currently supported on Prestashop without overwriting the module. On other platforms maps rating values inside review_count and rating_value following the product tagging. Magento doesn’t have by default a supplier cost (the buy-in price used as a basis to calculate margin), but you can map the cost to Nosto from a Magento product property where you store it by navigating to System > Configuration > Services > Nosto > Optional Properties by using a simple toggle to choose the correct product property in your Magento setup. Support is from Nosto Magento version 2.10 or above. Shopify doesn’t have by default property for margin, but if you have the detail available in your Shopify, contact Nosto’s support to map the detail to your Nosto account. Nosto maps margin automatically if this is available in your Prestashop setup when using at least Nosto extension version 2.8.0 or above. Margin is a sensitive detail and thus should not be added to product tagging visible in page source. If you’re on other platform, upload your product catalogue and margin detail to Nosto using the ProductAPI. Inventory is mapped automatically on Nosto Magento Extension 2.10 and above. 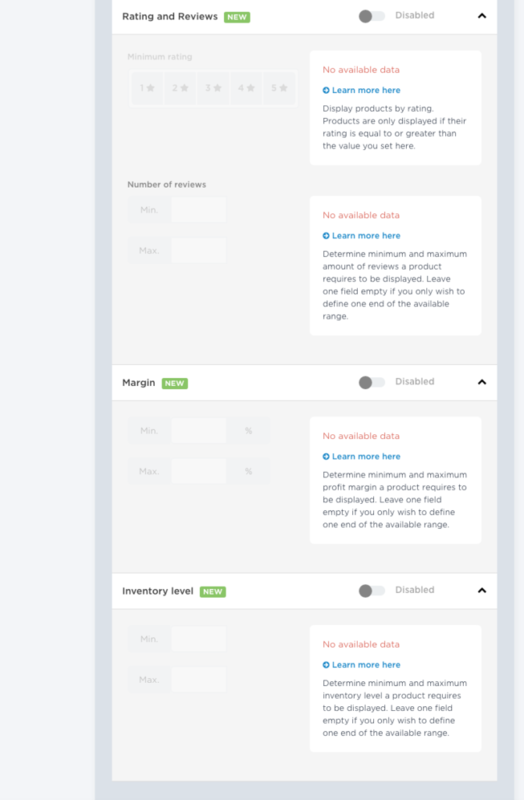 Inventory is mapped automatically if Shopify handles product inventory. Inventory is mapped automatically on Nosto Prestashop Extension 2.8.0 and above.